I recently had the opportunity to repair a computer power supply for a friend and, since the module that needed fixing was the fan driver, I thought it would be a good idea to see how it works. 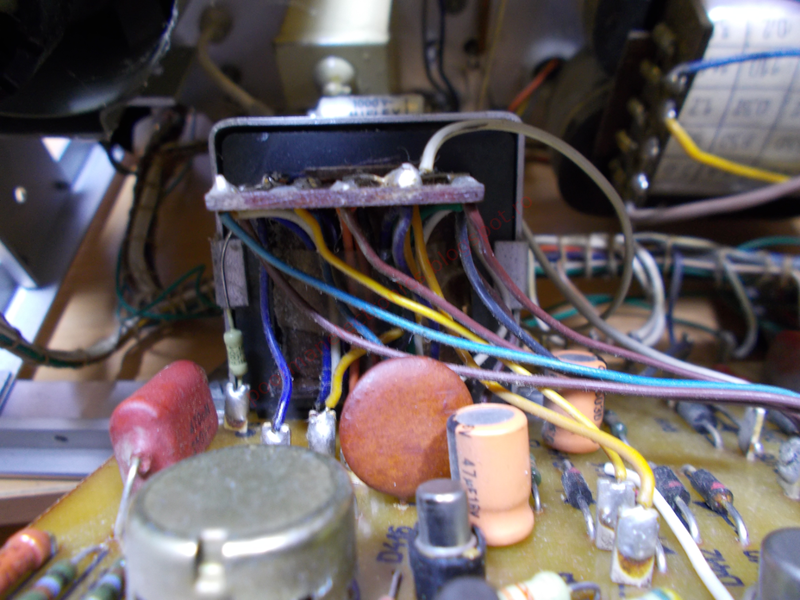 There are 2 TO-92 PNP transistors, a few resistors, a capacitor, a diode and a 10K NTC thermistor which is thermally bonded to the heatsink of the switching transistors with some sort of white, rubbery adhesive. 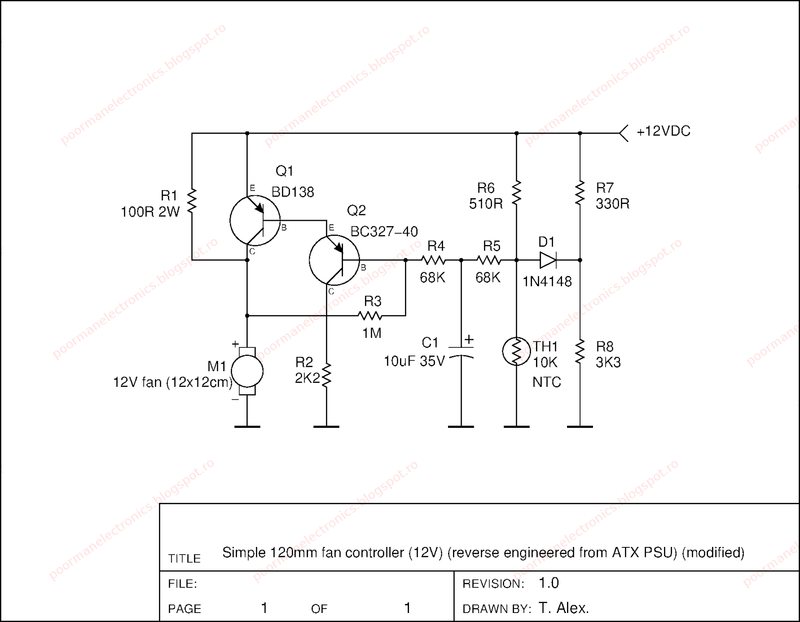 The circuit is powered from the 12V rail and spins a 12x12 cm fan (rated 12V and 0.3A). 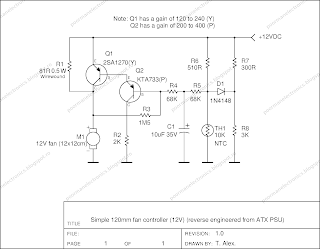 One of the issues with this circuit is that it works at the limit of some of the components and that's why it needs to be mounted in the airflow of the fan. 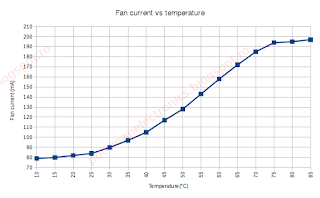 R1 (81 ohm) gets pretty hot: it has a voltage across it of 6.56V when the NTC is at 15 degrees C. It is used to keep the fan running even when the NTC detects low temperatures. Using Ohm's law we can see that the current through it at 6.56V is 80 mA so it dissipates 0.53W, more than the maximum rating of the resistor. Granted, the heatsinks of the power supply would never see that low of a temperature, but I still find it a bad idea to use undersized components. Also, in the same conditions Q1 also gets quite warm because it is being used in its active region (like a sort of variable resistor). 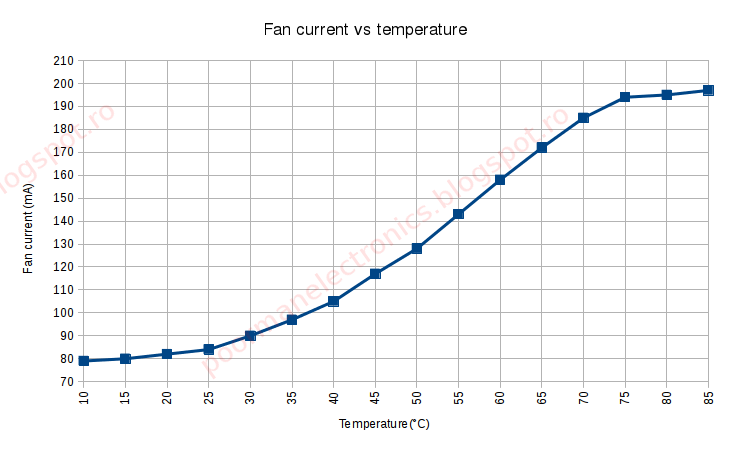 At higher speeds, all components run cool (Q1 enters saturation and steals the current from R1 which then cools down). 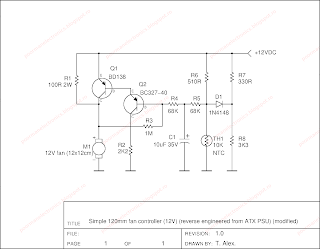 Having given the PSU back and being curious about the workings of this little circuit, I went on to duplicate it and test it. One of the first issues is that the transistors are a bit exotic (KTA733-P and 2SA1270-Y). 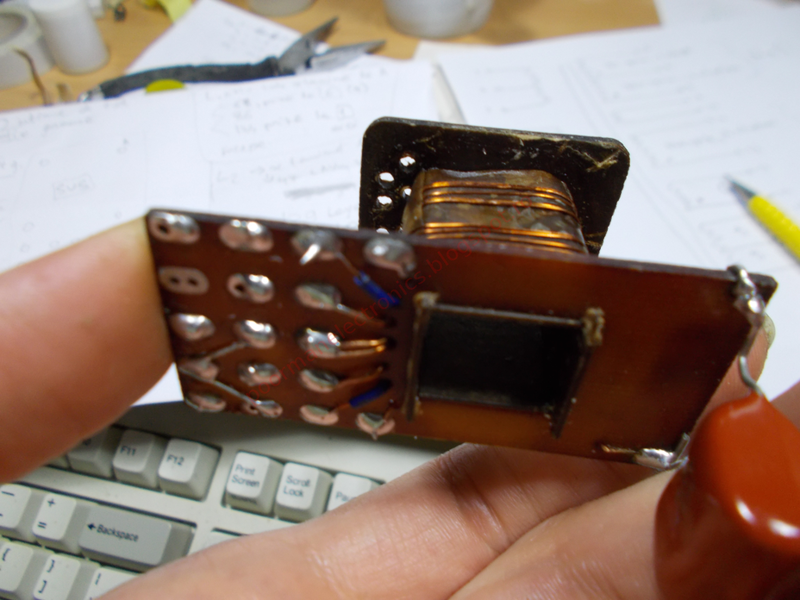 They both seem to be made by KEC (Korea Electronics Corporation). 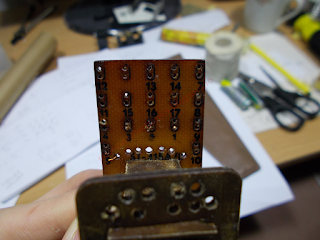 Also I couldn't find some of the resistors in my toolbox so I changed the values to the closest I had. To fix the above-mentioned heating problems, I decided to replace R1 with an 100R, 2W resistor and Q1 with a medium power transistor, the BD138 which can also be heatsinked if need be. 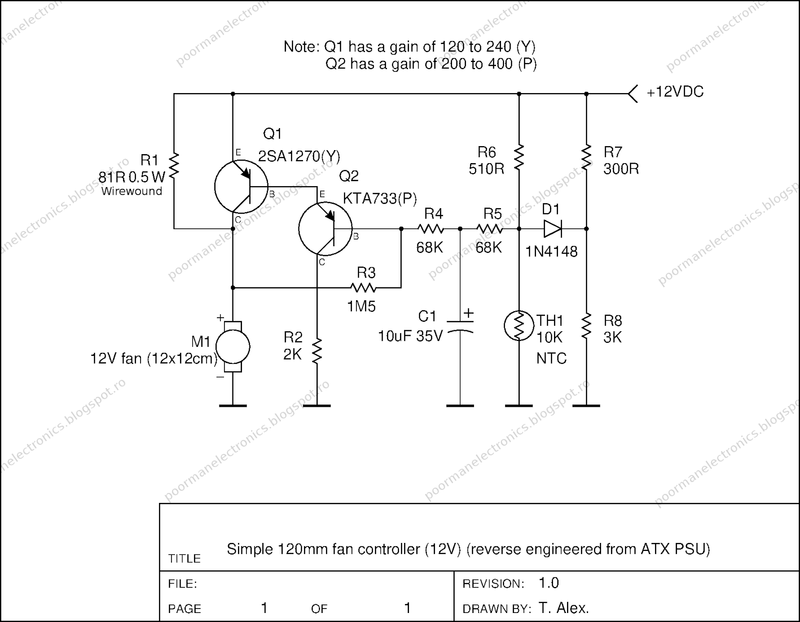 These modifications make the circuit more reliable and more adapted to general purpose use. 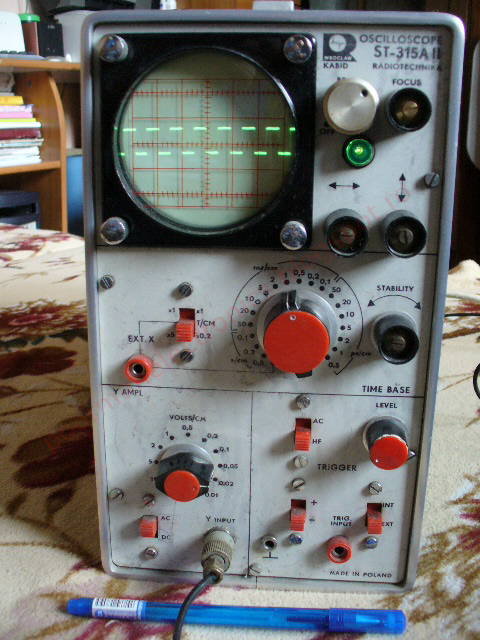 Some time ago I have found this old, portable oscilloscope for sale on a local electronics forum. 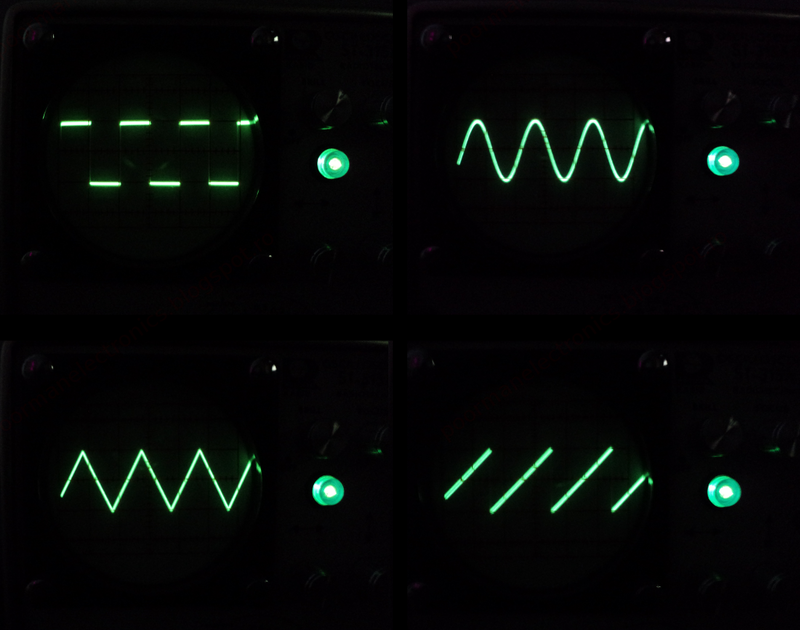 Judging by the fact that the price that was asked for it was very low, I had no expectations about its performance, but still decided to buy it, mainly because analog cathode ray oscilloscope are a dying breed, having been replaced by DSOs. The unit (Kabid ST-315A II) is made in Poland in 1979 by the state company Radiotechnika in the city of Wrocław. 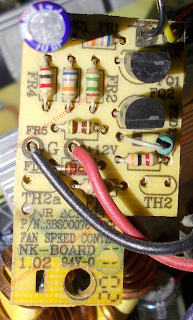 This model is fully solid state (transistorised) unlike the previous model (ST-315) which was a hybrid that used both valves and germanium transistors. This is a big plus in terms of reliability. Overall, the quality of the components is very good, pretty much all of them are well within tolerances, except for the electrolytic caps (which are disposable by design). I gotta commend the Poles for being smart and keeping their companies alive until today, for example Telpod & Miflex which are still around. It's always nice to see that some parts are still being manufactured in Europe. 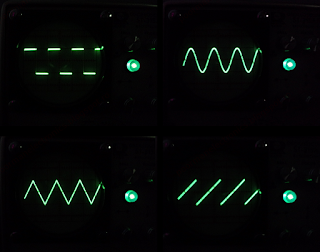 Soon after receiving the parcel, I started playing with the scope a bit and check if everything still works. Right off the bat, after starting it up I noticed that every 1 minute or two, the screen would black out for a few moments (trace would dissapear) and a crackling sound could be heard (like sparks flying). Also, the whole time it was on, the unit would make this loud, continuous, high pitch "squeeling" noise which made its usage impossible unless wearing ear protection. 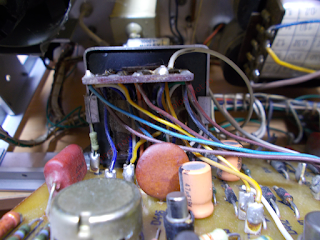 There were no cold joints to be seen so I soon came to the conclusion that the power supply was malfunctioning, especially after checking the voltage rails. 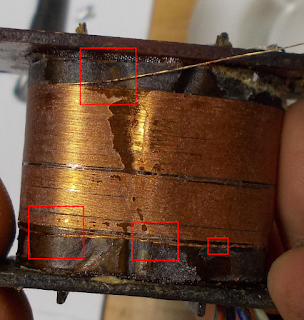 The +12V and -12V lines were close to normal (about 0.5 volts off each), but the +80V rail was at 72V and the +900V one was at 680V. First up, I replaced all the electrolytic capacitors because almost all of them had their ESR way beyond the normal limits. 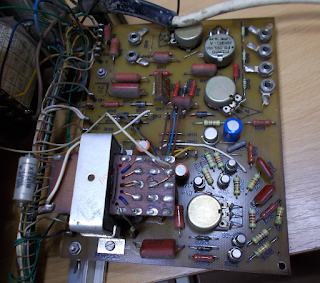 This operation however didn't fix the noise nor the voltage dip. Searching the web revealed that the problem is quite common with this model. Most of the results were from elektroda.pl (for example https://www.elektroda.pl/rtvforum/topic1314764.html) where people were asking how to fix the "ostry pisk" which translates to "sharp squeal". 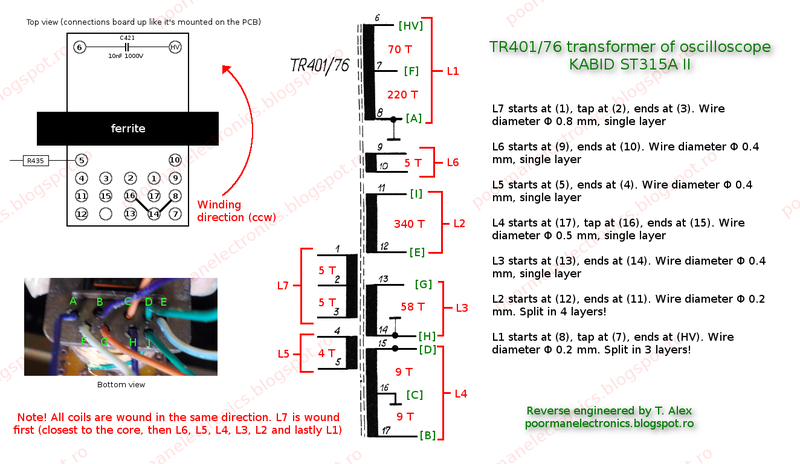 Using the schematic (attached at the end of the article), I started to dig inside the oscilloscope's power supply. Powering it with the case open (not very safe) helped me trace the high pitched sound to the high voltage transformer TR401/76. Jamming some pieces of cardboard between the ferrite and the metal brace had no effect, the sounds were being produced by the windings themselves. 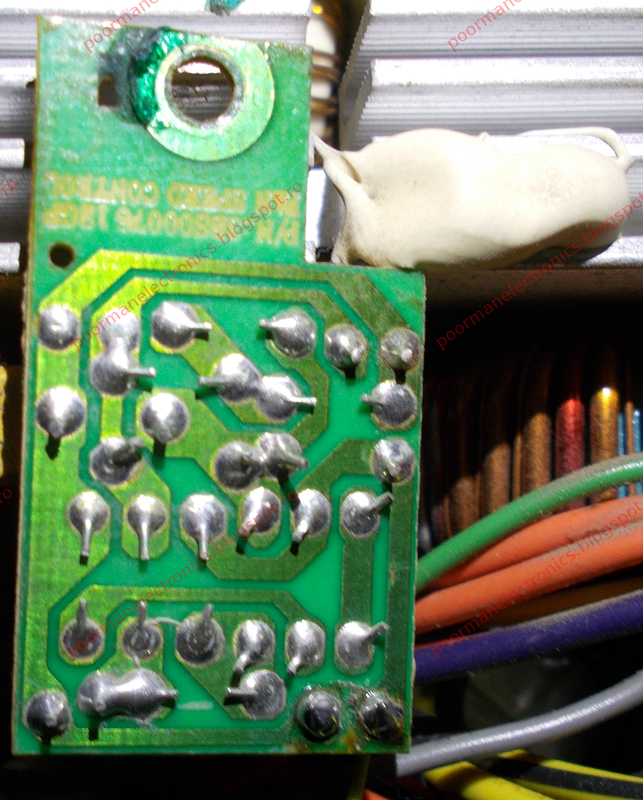 After making pictures with all the wires, I managed to get it out from the PCB. 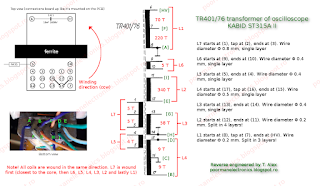 Not having any documentation about this transformer, I decided to unwind it and count the number of turns then rewind it with new magnet wire. This is where hell started. 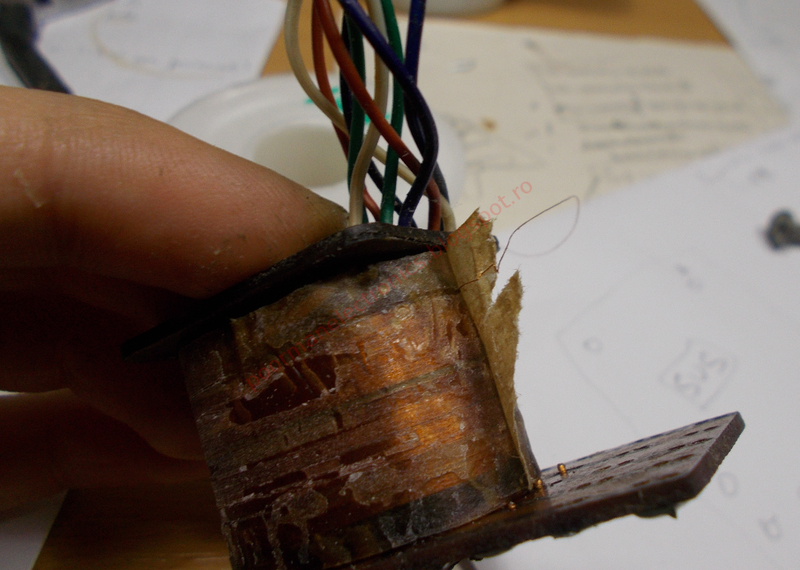 Inside were 7 windings, some of them having hundreds of turns wound in layers, with really thin wire (0.2 mm). Working on this without proper coil winding equipment was admittedly not the smartest thing I've ever done. While the designers were smart to split the windings into layers to prevent arcing, the insulation was pretty thin and made only with wax paper. Thin paper insulation and high voltage. What could go wrong? After unwinding some layers I could smell burnt paper and the magnet wire was slightly discolored. Due to overheating or bad enamel quality, the insulation might have broken down and sparks jumped from one layer to another through the thin paper isolator. After a few tries, I managed to rewind the transformer completely. 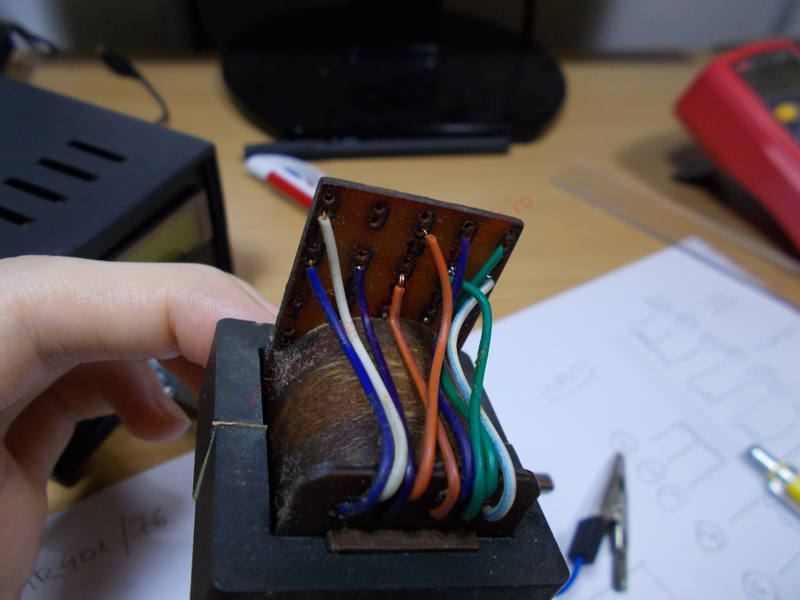 The most difficult part was making the last 2 windings because the wire was very fragile and would break if too much tension was applied. I used a small electric drill and a modified calculator to keep track of the turns. Testing revealed that the squealing was much less audible, but the frequency of the SMPS was still low enough that I could hear it. 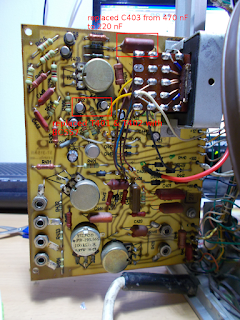 I suspected that some of the semiconductors might also be damaged so I checked everything on the power supply board. Finally, I found that T402 (BC177) had a gain of 10 instead of at least 125 so I replaced both T401 and T402 with BC557. Then, to increase the frequency of the SMPS, I replaced C403 from 470 nF to 220 nF. Finally, some silence! Nothing compares to the good old green CRO traces! You can print the PDF files on A4 paper then carefully cut the edges and assemble them with sticky tape to make big sheets which are easy on the eyes when repairing things. And if anyone has got a copy of the instruction manual of the export version (in English) and would like to share it, please let me know.